Tired of opening all of your mail one piece at a time? Why not consider an electric letter opener? We have options that are designed to sit on your desk to help you process the mail as it comes in. Or if you are looking for something larger we have models that are designed to handle high volumes of mail inside of a corporate mailroom. Or choose something in between. Whatever your needs, we have a letter opener that should fit your needs. 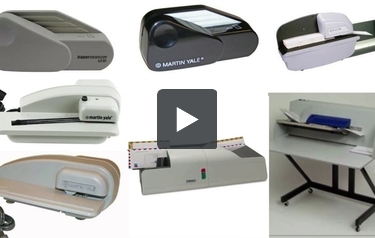 We carry the full line of Martin Yale and postmark letter openers as well as a number of manual inexpensive options. Take a look at the choices below and select the option that best fits your needs. Compact size allows it to fit in any desk drawer or on desktop. Features a protected firmly secured blade. This is MyBinding video. If you’re looking for a letter opener or a letter opening machine, you’ve come to the right spot. At MyBinding.com, we find all kinds of things to help you out in the office. Whether it’s a handheld elegant or simple or a full machine, we have a letter opener perfect for you. Whether you have just one letter or a whole stack, let us help you out. Give us a call. We’d love to answer the phone and find you exactly what you need in any color, shape, size or quantity. So just keep shopping around until you find exactly what you need. We have plenty of stuff here. When image matters, MyBinding.